Diamond Comic Distributors recently released its charts of comics and trade paperbacks ordered by retailers in April 2009, and as reported earlier, the market appears to have made up some of the ground lost in the first three months of 2009. Sales increases versus the previous year were observed in all categories, including, just barely, unit sales of Diamond's Top 300 comics. The largest gain was seen in the widest category: overall orders for comic books, trade paperbacks, and magazines were up at least 14% in this five-ship-week month. The operative term is "at least," as there is evidence to suggest it was higher still — but The Comics Chronicles approaches this statistic with some caution this month. At least one very large backlist promotion put a much larger than normal amount of volume in the system at much deeper discounts, causing the full retail value of orders in the "long tail" to increase far more than did orders in the Top 300 trades. This poses an analytical dilemma, as the metric outside observers most often see in looking at sales volume is full retail dollars — not what retailers paid for books, but what those books would be worth had they all sold at full retail. It's not possible to know what publishers and Diamond realized without knowing exactly what they all received; retailers order at different discounts, and everything from the product mix each month to publisher promotions causes the wholesale-to-retail ratio to fluctuate. It's usually much easier just to describe the number of dollars worth of comics at full retail that entered the system — that at least gives us an apples-to-apples comparison across time. This month, it does appear that discounted backlist sales did move the needle enough to expand the "overall" figure beyond the expected range — which is why that figure requires some caveats. It appears that at least $42 million in saleable comics and trades did enter the retail system; the wholesale-to-retail ratio simply may not be the same as, say, October, a month which a similar sum moving. 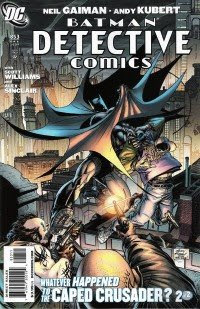 April 2009 also saw a historic first: The top-selling comic book at Diamond, with first-month orders of at least 104,100 copies, was Detective Comics #853, a Neil Gaiman issue — and it is amazing to consider that this is probably the first time that this, the longest-running ongoing series in American comics, has ever topped the charts. We know from looking at the Diamond top sellers from 1996 to present that Detective has never led the list in that time: Batman, many times, but never Detective. Checking Capital City Distribution sales charts from 1984 to 1995 finds that Detective never topped the list there, either. Before 1984, monthly reports are not available — but annual reports suggest that the title probably never ranked higher than eighth, which appears to have occurred in 1967 when the Batman television show launched Batman title to #1; even then, Detective was only DC's seventh-best-selling title. Rankings before 1960 are largely speculative, although some available figures from the Audit Bureau of Circulation suggest that Detective would have been behind several of the Dell titles, at the very least. After 853 issues, Detective appears to have added another first to its history. The average comic offered in the Top 300 cost $3.43; the average comic ordered cost $3.37. Even with the potential problem in the overall figures, this is clearly a good rebound; we can see in the narrower categories that the market has made back some, but not all, of the ground lost in the first quarter of the year. And it's noteworthy that April 2009 saw the Top 300 selling more units than 1, 5, and 10 years ago. April 2008's top seller was Secret Invasion #1, the best-selling comic book at Diamond taht year, with first-month orders of approximately 250,200 copies in the direct market. Check out the sales chart here. April 2004's top-seller was Jim Lee's Superman #204, with first-month orders of 231,400 copies in the direct market. Check out the sales chart here. April 1999's top-seller was Uncanny X-Men #369, with preorders of approximately 129,900 copies in the direct market. Check out the sales chart here. April 1994's top seller at both Diamond and Capital was X-Men Vol. 2 #33. Capital alone sold 107,750 copies of the issue; the Statement of Ownership for the title put overall monthly sales at an average of 614,075 copies that year. April 1994 was also notable in that Capital City also published a column showing what percentage of its comics unit sales each comic book was, all the way down to its poorest-selling new title; from this, we find that the Top 300 accounted for 95.35% of all its new comics sales — and that the breakdown within the Top 300, when compared with that of April 2009, is not altogether different. The comparison finds that nearly the same number of titles account for half the unit sales in the Top 300 (58 in April 2009 versus 61 in April 1994). The April 2009 Top 300 table was slightly less hit-driven at the very top of the list — and the share of all sales represented by the Top 25 titles is almost identical. Once we extend out to the Top 100, we do see the top of the list accounting for more of the sales in the table — 69% in 2009 versus 65% in 1994. Comics in the 100s account for fewer units than they had 15 years ago, while the share represented by comics in the 200s accounts has shrunk the most. On the other hand, their dollar share has held up better. An in-depth look at these months in comparison can be found here; a further look at the changing shape of the Top 300 over the years can be found here. April 1989's top seller at Capital City was Uncanny X-Men #247. Archival sources available to The Comics Chronicles confirm total sales of 413,300 copies of that issue, including 99,000 newsstand copies and 282,600 direct-market copies. Capital alone ordered 79,500 copies. Finally, April 1984's top comic book, both at Capital and likely everywhere else, was Marvel Super-Heroes Secret Wars #4, continuing the year-long mega-cross-over. Secret Wars was the #1 book at Capital every month in 1984, a record matched later only by Todd McFarlane's "adjectiveless" Spider-Man #1-12 in 1990-91. How much of new comics sales is in the Top 300?